Want to show of your cool DIY CNC machine, but it’s just to cumbersome to take it with you? 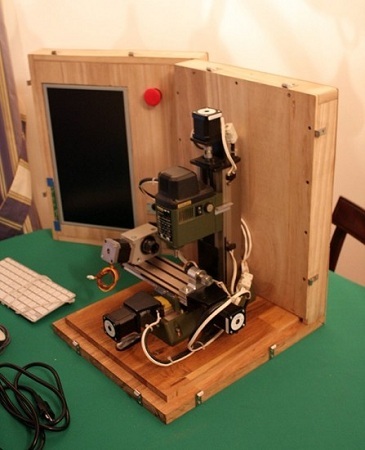 Here’s a portable DIY CNC machine (machine translation). Enclosed inside the plywood box is the CNC, along with a computer running LinuxCNC, a monitor, and an interface controller. The work area is 120mm/40mm/80mm in the X/Y/Z axis. This entry was posted on Friday, December 28th, 2012 at 11:00 am	and is filed under DIY, tools. You can follow any responses to this entry through the RSS 2.0 feed. You can skip to the end and leave a response. Pinging is currently not allowed. Looks really nice. LinixCNC is a great program too!